So there is a ready-made answer to global recession. And that answer lies in space. By now, you will probably know that The White House has rejected an unusual proposal from John D. of Colorado, who has managed to rally thousands of Americans to request an unusual form of New Deal. To create employment in a flagging economy, and improve security immeasurably, why doesn’t America build a Star Wars- Style Death Star? the petition inquires politely. If we look back to Franklin D. Roosevelt we must own that the request follows a well-trodden path. A short, sharp reprise of the Civil Works Administration of 1934-5 might be just the trick to get the mojo of the American people back. Chief of the White House’s Office of Management and Budget’s Science and Space Branch, Paul Shawcross, was forced to reply because the number of signatories on the petition – lodged on the ‘We The People’ governmental petition site – was 35,000. This exceeds the 25,000 which automatically trigger a response from the site. “The Administration shares your desire for job creation and a strong national defence, but a Death Star isn’t on the horizon.” Shawcross responded. 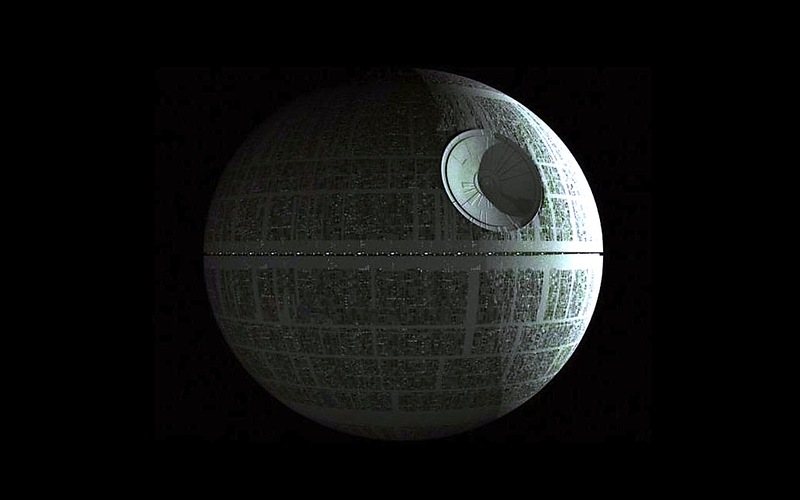 He says the estimated cost of constructing a Death Star would be over $850,000,000,000,000,000 ($850 quadrillion). That’s a lot of money. I have never heard a quadrillion used before. And its quadrillions, too, are inextricably linked with space. Their quadrillions have been muffled beneath a Soviet security blanket for years and only in September of last year (2012) did they come to light. Accidents happen. And one which must have created quite a stir on this little globe happened about 35 – 37 million years ago when a great big asteroid estimated to be between five and eight kilometres across had a bust-up with Siberia. No-one messes with Siberia and wins, I hear you say. But this asteroid managed to dig a massive crater in the surface of the unforgiving region. The impact shock had an astounding effect on the graphite which was present in the ground there. For a stretch of eight miles it turned the mineral instantly into huge, high-class diamonds. The 62-mile hole in the ground is a grand old hole now, and glories under the name of the Popigai Astroblem. And it is stuffed, to the gunnels, with industrial strength diamonds worth quadrillions. Russian premiers since the 1970s have had the place classified, but mined it remorselessly. They sat silently on the hole, not telling anyone where their endless supply of diamonds came from. But now the secret is out. Russia has its quadrillions. Perhaps it could use them to build a Death Star. It is worth noting that the Popigai Astroblem is only the seventh largest asteroid crater on earth. It may, they say, have formed simultaneously withe the Chesapeake Bay and Tom’s Canyon craters in the USA. Could there be a Death Star’s worth of diamonds nestling somewhere in Uncle Sam’s back yard? And so: untold riches may be caused by asteroids. Thanks to the abundance of space, we could fund a space-based New Deal. And get NASA on the phone. Posted in WhimsyTagged asteroid, Death Star, humour, Popogai Astroblem, space, We The PeopleBookmark the permalink. I’m already checking out the garden. Good luck. An old French meteor. Jules Verne would love that one. Cure for unemployment and create prosperity: If you sell it here you must make it here. This would allow foreign investment and allow them to profit yet keep the jobs home. What we make on earth we sell on earth: makes perfect sense, Carl. I feel a certain reticence about letting extra terrestrial investors in on the act, though. Quick, Tom. We must seek out the nearest English meteor site with all speed. We’ll be rich beyond the dreams of avarice. Holy craters, Batman! Look at the possibilities!! 😀 That’s quite a lot of craters, Karen. Diamonds will be available at knock-down prices before we know it. One thing: I couldn’t find any mention of the Popigai Astroblem. Maybe the map is pre-September 2012. But it does ask the question: are there really that few meteor sites in Russia? What are we not being told, I wonder? Wonderful flight of fancy, Kate. I benefited from a New Deal project while in college. Stop that! I am NOT that old . . . I didn’t do the work, I reaped the rewards. At the College of William & Mary, there lies a Sunken Garden ~ a place to sunbathe, play Frisbee, picnic, hobnob, play the guitar ~ a campus diamond created, not by asteroids, meteors, or death stars, but by people digging a football sized field of a trench with stone stairs and pathways across ways. Thanks Sorted. So a sunken garden was part of the New Deal! Wonderful. We talk a lot about Roosevelt and his policies here at the moment, as our government squeezes the life out of its public sector. The Guardian online has a wonderful subheading today: “Death Star Shot Down”. Who would’ve thunk it? ..and what’s not to like about that? I bet Russia and China already have one, and just haven’t mentioned it to anyone yet. Best – and coolest – post I’ve read in a long time. Thank you, Hook! Thanks for coming along to read. Since many Americans already feel that our money is going into a vast Black Hole … the Death Star proposal is no surprise. Indeed. What’s a few more quadrillions, Judy? You do realize that $850 quadrillion is a lot of taxpayer dollars — and would never get approved by the constantly gridlocked congress over here. The thought, Lame; had never crossed my mind. Back to the drawing board, then. Synthetic meteor factories in space, maybe. I want to know all there is to know about those diamonds! That’s a surprise! It couldn’t possibly happen in America. We don’t know how to save anything! “No-one messes with Siberia and wins” – I like it. Ah, a reprisal of the space race of the 60’s. Only you, dear Kate, would find a way to renew the competition between Russian and America. I’m humming Lucy in the Sky with Diamonds . . . I am going to take this completely off topic and offer this for you. I suspect Felix (and even Phil) would love it. I checked out U. S. craters and found one near Odessa (Texas), but it was only 100 feet deep, and now it’s only 15 feet deep, so I guess that was too wimpy a meteor to produce more than interesting rocks. An excavation project in 1939 provided some New Deal jobs but no diamonds. I wonder what Texas would do with those diamonds if we had them.